The VigorIPPBX 3510 series serves as an IP PBX, central firewall and VPN gateway for multi-site offices and tele-workers. With its rich-featured IP PBX and the optional FXO/FXS/ISDN TE/ISDN NT interface card, the device increases the utilization of IP for the multi-site business operations. The robust firewall and up to 32 simultaneous VPN tunnels help you gain competitive advantages and strengthen productivity. The VigorIPPBX 3510 uses voice and IP technology to provide you with a converged communication solution. Through its easy-to-use Web UI, up to 100 IP phones can be registered at this IP PBX system. Moreover, via Internet, the remote users can also register at VigorIPPBX 3510 for their SIP-based voice communications. Keep colleagues (even remote workers) and customers in touch. You hence increase connectivity by call management, voice trunking, networking and more. Not only saving money of traditional telephone communications, but also improving customer service for your business. 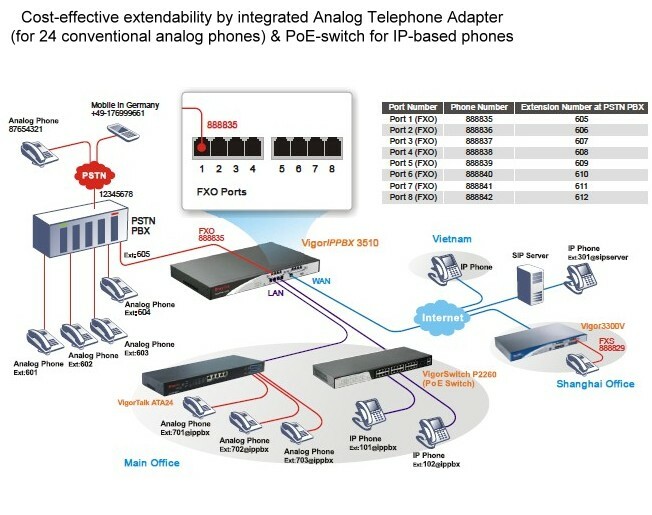 The SIP-based voice communications can be trunked via the SIP service providers and IP PBX SIP server of VigorIPPBX™. The VigorIPPBX 3510 is equipped with premium voice quality for concurrent calls. You can hear crystal voice even the voice routed from abroad. The integration of FXO interface card with PSTN PBX will allow remote site to dial into IP PBX and then get a PIN code to dial through PSTN PBX to local call or foreign calls vice versa. Use this functionality; your employees can work from home via soft-phones. So, no more excuse about the inclement weather; the productivity of your business does not stop! The VigorIPPBX 3510 can optimize efficient communications without compromising frequency and people you specify. For a company itself, it can add more extensions by registering IP account on VigorIPPBX™ without adding cost onto existing PSTN/ISDN PBX. Your employees, suppliers, customers and partners can communicate at lower or even zero cost. Even if you need to set up a remote office without DSL connection; you can use 3.5G USB modem as primary connection for Internet as well as VoIP. The establishment of liaison is easy and fast. The installation of VigorTalk ATA-24 with VigorIPPBX 3510 will let you build up an ideal call center where you can recruit versatile language speaking employees located at different countries. (One luxury thing for MIS – no need to replace legacy conventional PBX and relay lines for adding extensions) In addition, your entire employees — even in different countries–can be contacted by dialing prefix no. or extension no. The site-to-site calling costs are eliminated sharply. Let’s grow your business processes and customer loyalty all together. 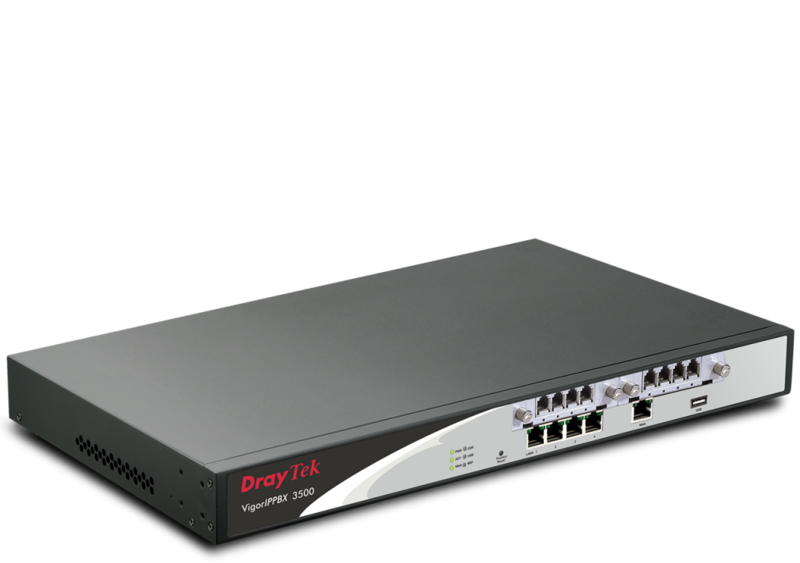 The VigorIPPBX 3510 series also provides high-security firewall options with both IP-layer and content based protection. The DoS/DDoS prevention and URL/Web content filter strengthen the security outside and inside the network. The enterprise-level CSM (Content Security Management) enables users to control and manage IM (Instant Messenger) and P2P (Peer to Peer) applications more efficiently. The CSM hence prevents inappropriate content from distracting employees and impeding productivity. Furthermore, the CSM can keep office networks threat-free and available. With CSM, you can protect confidential and essential data from modification or theft. With a dedicated VPN co-processor, the hardware encryption of AES/DES/3DES and hardware key hash of SHA-1/MD5 are seamlessly handled, thus maintaining maximum router performance. 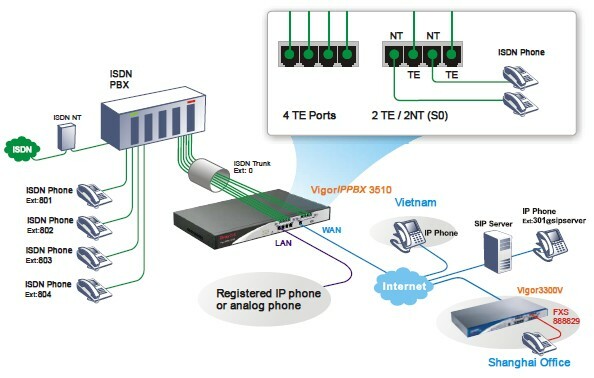 For remote tele-workers and inter-office links, the VigorIPPBX 3510 supports up to 32 simultaneous VPN tunnels (such as IPSec/PPTP/ L2TP protocols). Let high-perfomance multi-VPN connection to secure your communication. Its well-structured Web User Interface offers user-friendly configuration. The WUI also provides IP layer QoS (Quality of Service), NAT session/bandwidth management to help users control and allocate the bandwidth on networks. The auto-provisioning lets efforts for deploying DrayTek VigorPhone 350 be minimized to little. Just “Plug & Play” to add extensions for the new blood of your company! 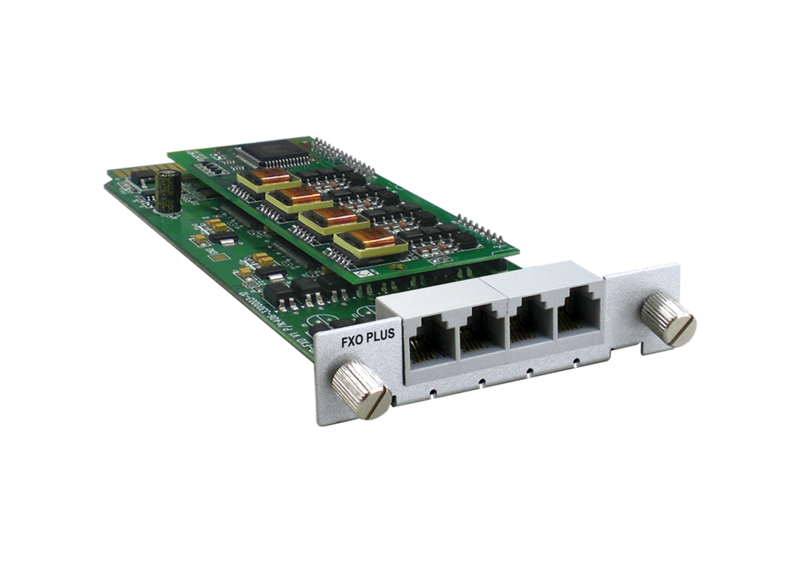 The platform of VigorIPPBX 3510 is able to let you choose 4-port ISDN BRI card (4 ISDN TE or 2 TE/2 NT interface card) in terms of your voice environment. 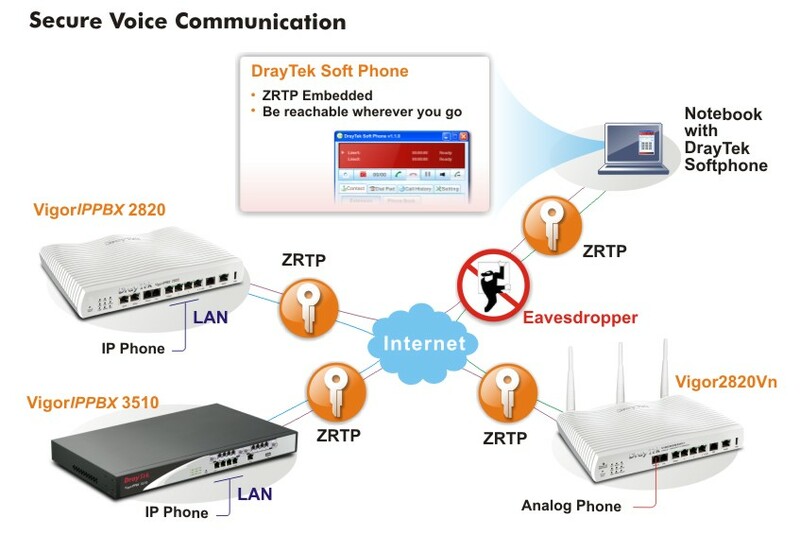 The ISDN phone can connect to NT -interface of 2 TE/2 NT interface card. The ISDN line can be connected to TE-interface. If you have ISDN PBX, you can connect one of internal extension to TE-interface of 4-port ISDN TE card. The call routing of VigorIPPBX 3510 will enable ISDN MSN mapping to IP extensions for forming compound extensions. It provides policy-based load-balance, fail-over BoD (Bandwidth on Demand) and also integrates IP layer QoS, NAT session/bandwidth management to help users control and allocate the bandwidth on networks. It allows users to access Internet and combine the bandwidth of the dual WAN to speed up the transmission through the network. Each WAN port can connect to different ISPs. Even if the ISPs use different technology to provide telecommunication service (such as DSL, cable modem, etc.). If any connection problem occurred on one of the ISP connections, all the traffic will be guided and switched to the normal communication port for proper operation. 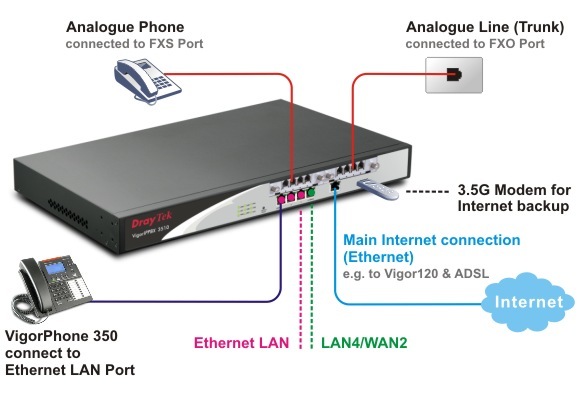 The platform of VigorIPPBX 3510 is able to let you choose 4-port ISDN BRI card (4 ISDN TE or 2 TE / 2 NT interface card) in terms of your voice environment. The ISDN phone can connect to NT -interface of 2 TE/2 NT interface card. The ISDN line can be connected to TE-interface. If you have ISDN PBX, you can connect one of internal extension to TE-interface of 4-port ISDN TE card. The call routing of VigorIPPBX 3510 will enable ISDN MSN mapping to IP extensions for forming compound extensions. It provides policy-based load-balance, fail-over BoD (Bandwidth on Demand) and also integrates IP layer QoS, NAT session / bandwidth management to help users control and allocate the bandwidth on networks.